Derind pork bellies have surpassed the all-time highs set in 2014 that at one point, the industry did not expect to approach again given the increase in pork production levels over the last several years. 2014 was an anomalous year due to the breakout of PEDV and the bouts of the rationally – and at times, irrationally – strong purchasing that stemmed from it. Ongoing bacon demand and record low cold storage stocks have made fresh product both highly desired and quite thinly available this year, leading to a nearly uninterrupted rise in prices since April. 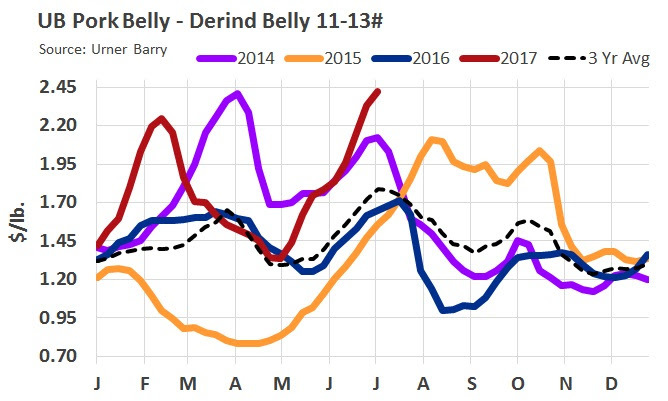 The current average price for 11-13# derind bellies is $2.43/lb, or $.01/lb higher than the peak in 2014.